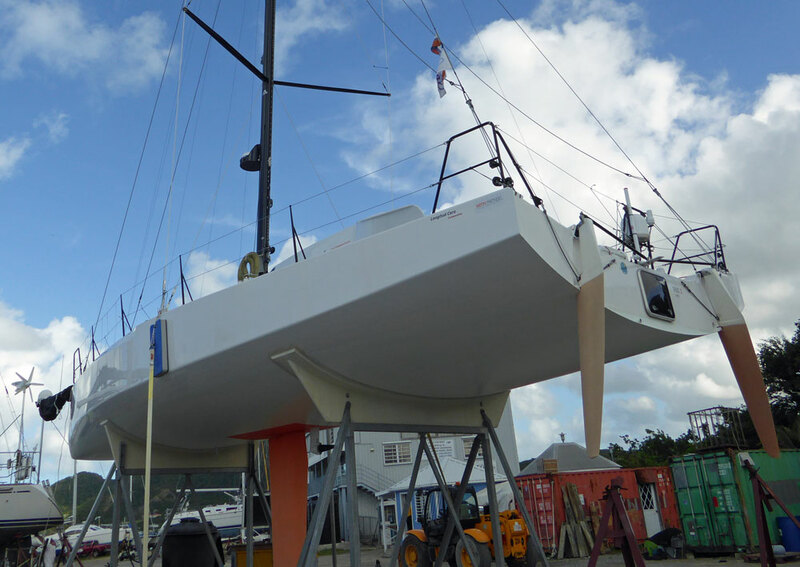 It's not enough just for a sailboat rudder to steer the boat effectively, it should also contribute to the keel's job of providing lift to windward, and for it to do this it must be designed as a hydrodynamic foil. Of course a rudder doesn't have to provide lift, but it's a wasted opportunity if it doesn't. As with an aircraft's wing, to develop lift the sailboat rudder must have water flowing over its leading edge at an angle of attack. Fortunately for us sailors, the pressure of air on the windward side of the sails, pushes the boat bodily off course slightly and it's this leeway that provide the angle of attack - or angle of incidence- that enables our keels and rudders to provide lift. But What Type of Sailboat Rudder would be Best for Alacazam? 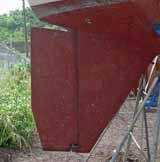 the boat, resting on the keel and two rudders can dry-out upright. with no propwash flowing over the rudders, manoeuvring under power in tight situations would be a little too interesting for my tastes. So the conventional single rudder approach it was to be. But what type of sailboat rudder? We liked the simplicity of this arrangement, but it didn't suit Alacazam's hull design at the stern. 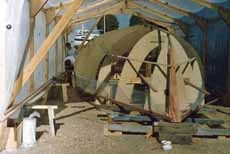 We wanted a sugar-scoop design with a bathing platform to allow easy access from the dinghy which ruled out a transom hung rudder. 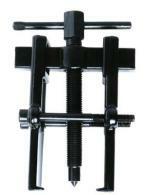 Similarly, it meant that mounting the servo-pendulum self-steering gear would be unnecessarily complicated. The spade rudder is the most efficient of all sailboat rudders, which is why you're unlikely to see any other design on racing yachts. The absence of a skeg means that all of its area is used to apply a turning force to the hull, minimizing wetted area and associated drag. 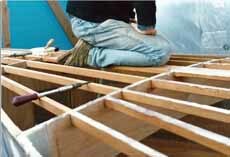 The area ahead of the stock helps to balance the rudder, making life easier for the helmsman. 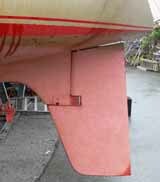 But it's not the most robust design, being entirely dependent on the strength of rudder stock to resist impact damage. Theoretically it's just a matter of engineering, but high performance spade rudders just aren't thick enough to incorporate a rudder stock of sufficient diameter for ultimate security. Other than those rudders hung on the following edge of long keels, the skeg hung rudder - supported top and bottom on a full length skeg - is the most robust design. Without a portion forward of the stock, there's no balancing force to take the load of the helmsman's arms - so loads can be quite heavy in some designs. 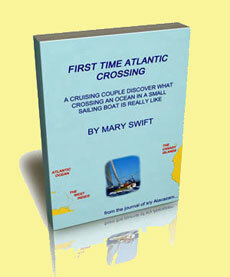 Nevertheless, it's a very popular design for offshore cruising boats. 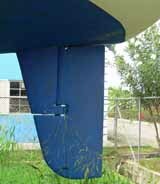 This design of sailboat rudder is something of a compromise between the spade rudder and the full skeg rudder. Supported at its mid-point by a half-depth skeg, it benefits by the area forward of the stock, below the skeg. 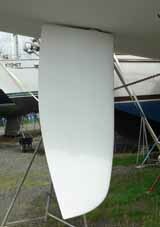 This applies a balancing force as the rudder is turned making the steering lighter than it would otherwise be. 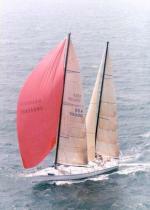 And it was this design we chose for Alacazam's rudder. 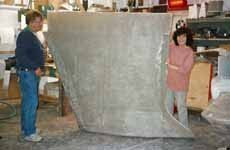 A typical productions boat's rudder is likely to have been fabricated as shown here, with two GRP mouldings 'clamshelled' around a foam core. Not the most reliable arrangement you might think - and you'd be right. We wanted something a little more robust for Alacazam's rudder. But first, the rudder stock. We fabricated this from a 2" (50mm) diameter stainless steel solid bar and welded on flat stainless tangs that would be embedded within the rudder. The Admiralty Bronze casting will eventually connect the rudder to the skeg. 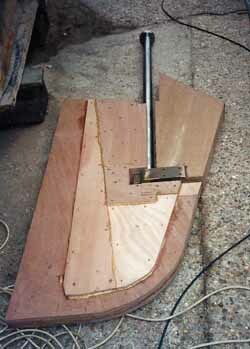 With the rudder stock fabricated, we began the construction of the rudder core. 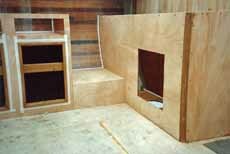 It was made up from half inch (12mm) marine ply sheets, cut to shape and incorporating cut-outs for the tangs, screwed and glued together. The rudder and skeg was built up as a single unit at this stage. The rudder design software generated coordinates for various stations along the rudder, and we used these to cut templates so that we could get the shape right. Shaping the rudder profile was done by hand, initially with a plane to remove the excess, then with a file and diminishingly coarse grades of sandpaper. 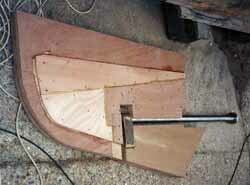 Once the rudder profile matched the appropriate template we removed the section that would form the skeg. Next, the rudder was fitted to the stock with any gaps between the tangs and the ply taken up with high-strength epoxy 'gloop'. Finally both the rudder and the skeg were sheathed in several layers of epoxy-glass rovings before being filled and faired with epoxy fairing compound. 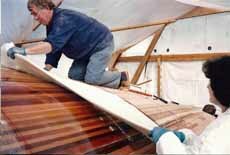 The skeg was letter-boxed through a slot cut in the hull, securely braced internally and bonded to it with fillets of high-strength epoxy and epoxy glass rovings. Inside the hull we had constructed a GRP tube to contain the stock, and the skeg was also bonded to the lower end of that. The rudder was then securely fitted to the stock via the bronze bearing, and located at the top of the rudder by a stainless steel bearing. That's it, we now have a very robust and efficient rudder securely attached to Alacazam's hull.